As known already, the audio launch for actor Karthi’s upcoming Tamil film, Kadai Kutty Singam, took place amidst much fanfare at Chennai recently. Directed by Pandiraj under Suriya’s 2D Entertainment banner with music by D. Imman, Kadai Kutty Singam has also been dubbed in Telugu under the Chinna Babu title owing to Karthi’s popularity in Andhra Pradesh & Telangana. With the audio for Kadai Kutty Singam launched, both Suriya and Karthi are at present at Vishakapatnam to attend the audio launch of the film’s Telugu version today evening. While at Vizag, Suriya and Karthi paid a visit to the world-renowned Shri Varaha Lakshmi Narasimha temple to seek the blessings of Lord Simhachalam Appanna. 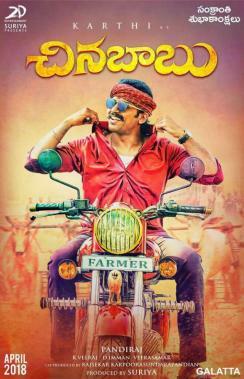 With many leading personalities from the Telugu film industry expected to grace the Chinna Babu audio launch, reports suggest the Tamil version, Kadai Kutty Singam, could hit screens sometime in mid-July. Kadai Kutty Singam includes a major ensemble star cast featuring Sathyaraj as Karthi’s father. Actress Sayyeshaa is slowly making her presence felt among fans in Tamil cinema and she will be playing the female lead to Karthi with Soori for the comedic relief. Post Meyaadha Maan, actress Priya Bhavani Shankar’s popularity soared furthermore higher among the youth and she plays the second female lead and possibly Karthi’s sister in the film.